While I was down in the Dallas metropolitan area this week, I had the opportunity to meet with a number of companies including Irving-based NEC. 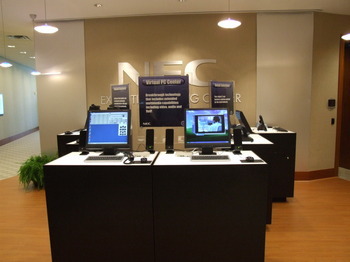 My colleagues and I were treated to a wonderful tour of the NEC Executive Briefing Center, which features many of NEC's offerings that are available to enterprises today. The tour also brought us 'round to two demonstration areas focusing on NEC solutions as applied to a pair of specific vertical markets: Hospitality and Healthcare. As expected these demo rooms were outfitted with the latest devices and applications designed to improve the experience for patients and medical staff in the case of the healthcare demo, and hotel guests and the staff that services them in the hospitality demo. Regarding what's coming down the pike, all I can say right now is that NEC is partnering with a well known networking company to provide a product that will help enable remote workers to be more productive. Their channel will have the product in hand by mid-August and will start reselling the solution, so we have to wait a bit longer for official word of the new solution. NEC also showed us a prototype of the next version of an enterprise communications server that's still in customer trials and should be announced by the mid-to-end of August. The solution is designed as a pure IP play, supporting all existing applications such as voice, mobility, and unified communications. The product will offer a smooth migration path for existing customers who wish to move to an all-IP infrastructure. Lastly, NEC officials told us to watch out for several new solutions spanning the following areas: speech, video voice mail, and some new things from the Sphere acquisition of one year ago. The NEC folks told me that, in terms of trends, they're seeing healthy activity in the hospitality and healthcare markets. 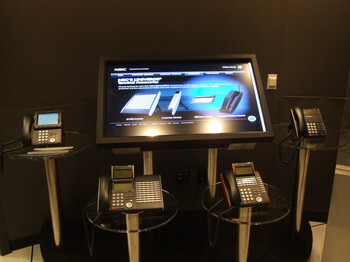 Also they say that unified communications is generating lots of traction in the SMB market as well.